Propagansey 2018. 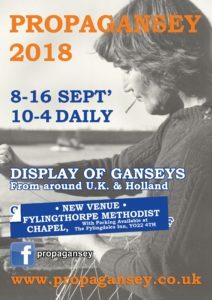 The 11th year for this impressive & unique display of Ganseys old & new from around the UK & the Netherlands. This year we hope to include items from the very successful Fishermens’ Mission exhibition that was an integral part of Hull’s celebrations as City of Culture last year. Knitters are welcome to bring WIP & be inspired by the surrounding collection; & if you’ve never seen a proper Gansey, now’s your chance to find out more! Frangipani 5-ply Guernsey wool will be on sale, alongside patterns & needles – & of course the advice is free ..
Propagansey 2017 – our 10th year! Please note change of address; Not at Old St Stephen’s Church, but at Fylingthorpe Methodist Chapel, just down the road opposite the shop. 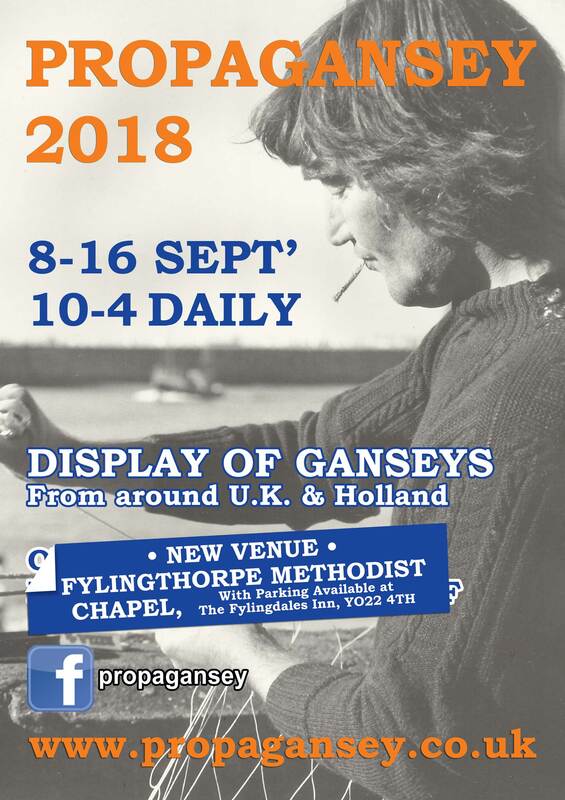 Once again, a unique exhibition of Ganseys from around the UK & Holland with 100% accessibility – come & be inspired. As well as Ganseys old & new there’s a couple of pairs of longjohns – one in baby pink! – also sample blankets, ie Liz Lovick’s Mystery Gansey Throw, a fascinating collection of Orkney pattern samples, & another from Zeeuwse Visserstruien. This venue also features a toilet & a kitchen .. & it’s just along the road from the Fylingdales Inn, who have kindly said it’s ok for visitors to use their car park, so please give them some trade in return. Margaret Taylor; Dot Normandale; Doris Rowe; Doug Heselton: Taddy Smith; Steve & Penny Locker; Steve & Nat, Wayside Flower; Katherine Boldry; Stella Ruhe; Anja & Stefanie from Zeeuwse Visserstruien; Erry Pieters-Korteweg; Jen Gordon, Bob Flann, Scottish Fisheries Museum; Liz Lovick; Sue ‘Red Indian’; Kathryn Logan, Moray Firth Gansey Project; Tom McGovern; Phyllis Swann; Mary Cummins; Karen Parkin; Anthony Noble; if I’ve missed anyone out it’s my fault. And to Alf Hildred. Fishermens’ Mission Exhibition in Hull Museum of Transport. This is one of those small exhibitions that leaves you with a lot to think about. 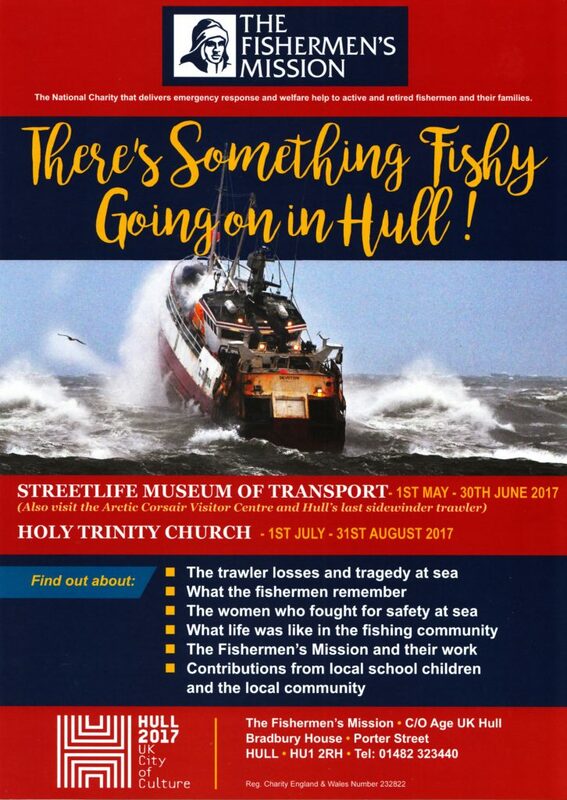 Organised by Ruth Creasey of the Hull Fishermens’ Mission, it includes aspects of the Mission’s history as well as recently filmed interviews with retired fishermen & their wives. It features a shoal of over 900 knitted fish, each bearing the name of a lost Hull trawler. There’s also a Humber Star Gansey & pattern samples, as well as input from local school children who tried their hands at net-braiding. Perhaps the most telling is the transcripts of the last radio transmissions by 2 trawlers who set out to render asssistance to a 3rd vessel in appalling weather conditions, who both became iced up & capsized. 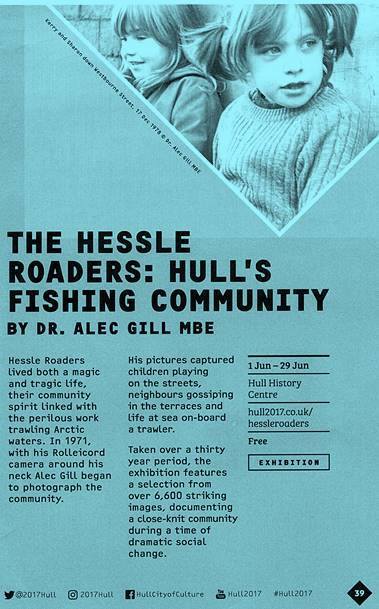 The Hessle Roaders; Hull’s Fishing Community, an exhibition by Alec Gill. Stop Press: by a narrow whisker, Propagansey will not be appearing on a special Apres-Winter Country File programme next month BBC Country File; but do ring it in your Radio Times because they will be talking to Margaret Taylor from Filey. She has been knitting Guernseys for 50 years & has appeared on Michael Portillo’s Railway Journeys. 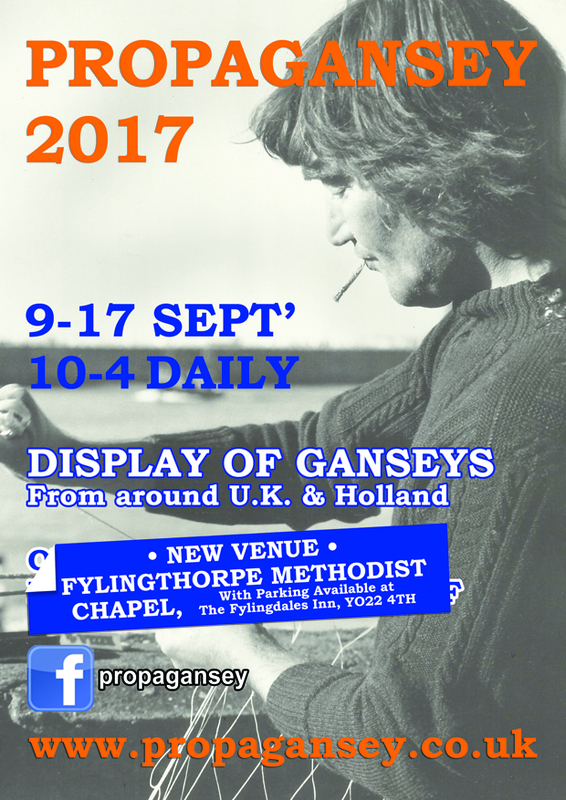 I’ll certainly be looking forwards to seeing a real expert on Country File & her Guernseys will be on display at Propagansey 2017, 9-17th September – watch this space for more details.